As I find myself sick in bed with a cold I've been enjoying some of this yummie ochazuke. This is truly comfort food. Is it tea or soup, or both? Who cares it's delicious! This is one of those dishes that hardly can be considered to have a recipe. All you do is stack a few ingredients in a bowl and dig in. Personally I really like this umeboshi version cause its really lean and plain. Most people would probably add some salted salmon bits, but each to their own. Place rice in a bowl (reheat if its cold). Pour in soy sauce and place bonito flakes and umeboshi on top. Sprinkle with spring onions and roasted seaweed. Lastly add the hot hojicha tea and dig in. 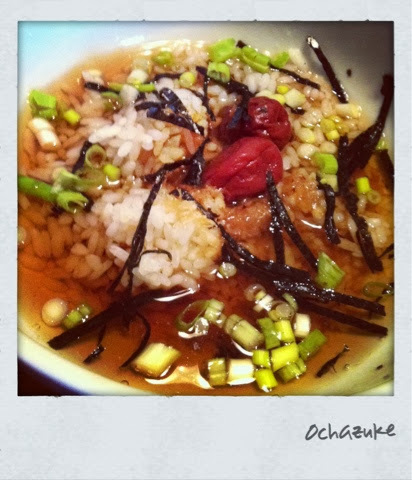 *For more tips & variations on ochazuke check out this site.